All U.S. citizens are required to enter and exit the United States with their U.S. passport, regardless of age and regardless of what other nationalities they may possess. All persons who have a claim to U.S. citizenship should apply at the Embassy or consulates for a U.S. passport before traveling to the U.S. The rules are sometimes complicated. For more information, check https://de.usembassy.gov/u-s-citizen-services/citizenship-services/, or contact the American embassy, your nearest American consulate, or your local Staatsangehörigkeitsbehörde or Standesamt. 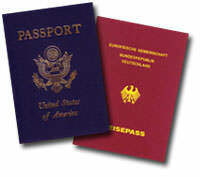 The German Embassy in the USA also has information in English on German citizenship.